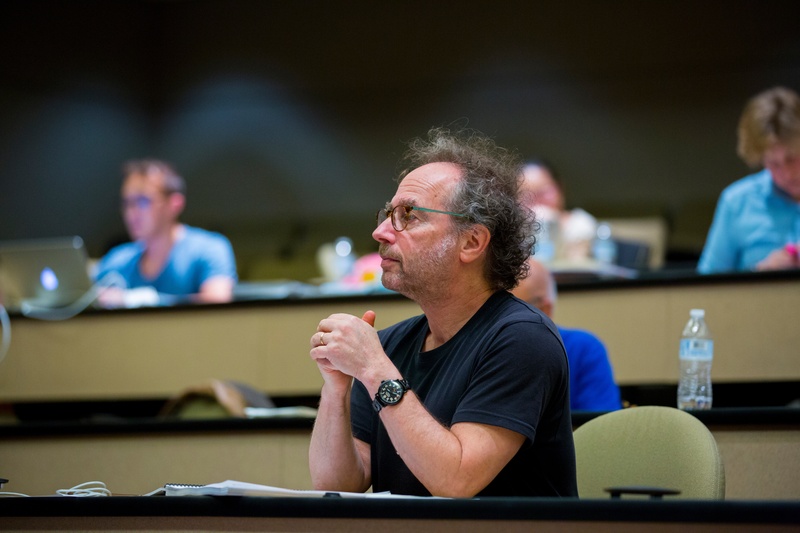 The title of Tod Machover’s new opera, Schoenberg in Hollywood, will likely be reframed as a question by many audience members, e.g. “Schoenberg in Hollywood?” What could the inventor—or perpetrator, depending on your perspective—of the musical revolutions of atonality and twelve-tone music, the composer whose works the philosopher Theodor Adorno described as severing the last connection to the listener, what could such a figure possibly have to do with Hollywood? The answers to this question that the opera poses can tell us a lot about Schoenberg, but they also provide interesting insights into how Machover has positioned himself in relationship to his famous forebear as well as the challenge of communicating complex ideas. Only one thing more fantastical than the thought of Arnold Schönberg in Hollywood is possible, and that thing has happened. Since arriving there about a year ago Schönberg has composed in a melodic manner and in recognizable keys. That is what Hollywood has done to Schönberg. We may now expect atonal fugues by Shirley Temple. But as this opera enacts so vividly, no one explored the question of “Schoenberg in Hollywood?” more deeply than Schoenberg himself. Schoenberg’s lifelong way of thinking and creating was marked by an intense self-consciousness, considering his place in history and his influence on the future, and often experiencing a profound self-doubt. Central to this process of self-examination—and the core of this opera—was the question of how he should or could relate to the broad public, a public that Schoenberg both disdained and desired to reach. Schoenberg had made this dilemma the driving force of his unfinished opera Moses und Aron (1923–37). Throughout Schoenberg in Hollywood, Machover interweaves the defining dramatic opposition between the characters of Moses and Aron, with Moses tasked to be God’s prophet but unable to find the words, and Aron blessed with the ability to communicate, but lacking a true vision of the infinite. 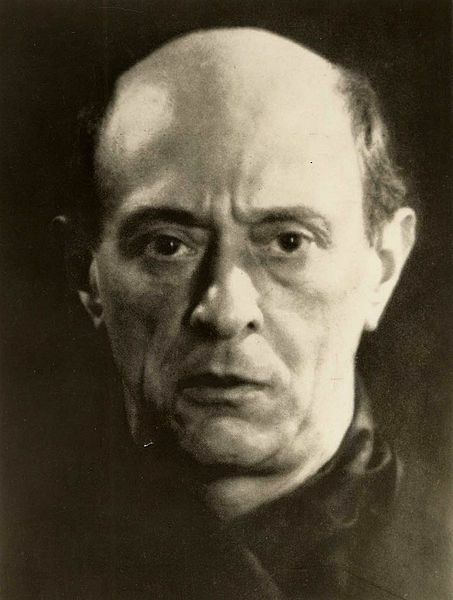 Schoenberg was most often associated by himself and others with Moses, rejecting compromise, dedicated to the pure idea, and embracing the image of noble isolation. The opera’s unfinished state and Moses’s closing lines, “O Word that I lack,” are often viewed as the perfect embodiment of the impossibility of communicating an ultimate truth. Thus, it is fitting that we first see Schoenberg with his back to the audience. But as Schoenberg in Hollywood dramatizes, Schoenberg also had a powerful affinity with Aron. This comes through in countless ways in his works and writings throughout his life, as for example in a 1931 lecture where he states, “there can be no one for whom it is more painful to be unable to communicate in an understandable way with his contemporaries.” We can see Schoenberg’s “Aron side” in his interest in engaging with jazz and other popular styles, his pieces for workers’ choruses, his orchestral arrangements of Bach and Brahms, and his fascination with new technologies including radio and—with central significance for this opera—film. Schoenberg’s idealism here also underscores a crucial dimension of his personality that comes through in several points in Machover’s opera and that is also evident in the kinds of projects that Machover takes on: a deep commitment to a belief that the world can be, and must be, made better. When Thalberg proposes setting the world to music, Schoenberg replies, “I’d rather set the world right.” Having experienced the rise of Fascism, Schoenberg was profoundly ambivalent about the public, and in Moses und Aron the masses are portrayed as fickle, easily misled, and prone to violence. But the whole point of the opera is about the vital need to persuade—and thus to liberate—the people, whose fate depends on understanding. In the same way, we can see throughout Machover’s career a commitment to engaging with big challenges facing society, as in Death and the Powers with its meditation on embodiment and artificial intelligence, as well as works like his City Symphonies which engage the audience and their sonic environments directly in the creative process. In Machover’s opera, when his meeting with Thalberg ends with Schoenberg sardonically saying that he would “think about it,” that is just what he does, and in his most characteristic manner of thinking though an idea to its fullest conclusions. Schoenberg’s subsequent discussion with his students leads him to imagine what it would be like to rearrange his life in film, like the twelve pitches are rearranged in his “method of composing with twelve tones related only to one another” he developed in the 1920s. Following Thalberg’s suggestion, he considers what a film of his own life could be if he were Moses and Aron together, “the past and future, tradition, revolution; style and idea.” We thus experience, as if we were in Schoenberg’s mind, how it would be to tell his life through the tropes and clichés of Hollywood films, films that could perhaps make him understood and appreciated. In a remarkable feat of storytelling, the libretto by Simon Robson, based on a scenario by Braham Murray, manages to weave together crucial features of Schoenberg’s life story depicted in a range of the Hollywood film styles, including a silent movie, a 1930s thriller, a Western, and a darkly distorted animated film. 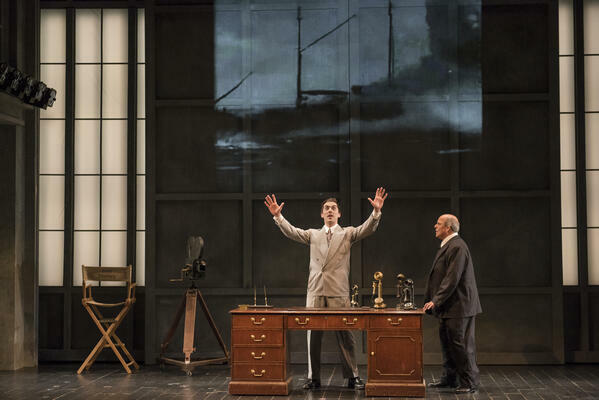 Opera-goers can trust that every event depicted has some clear basis in Schoenberg’s biography, though often intentionally distorted as he imagines how his life would be told through the Hollywood lens. Besides Schoenberg, the opera uses only two other characters, male and female singers who take on all the roles, starting with his UCLA students in the opening scene who serve as embodiments of the New World that Schoenberg found so exhilarating and mystifying. As the story unfolds, Machover interweaves his own distinctly propulsive and meticulously crafted musical language with allusions to various Hollywood film styles along with keys works in Schoenberg’s development. These include the Wagnerian Transfigured Night (1899), which is used in the context of his courtship of his first wife Mathilde, the sister of his friend and only teacher of composition, Alexander Zemlinsky. “The Painting Lesson” scene depicts the tragic affair between Mathilde and the painter Richard Gerstl, featuring a substantial quote of the Second String Quartet (1908) with its epochal break with tonality along with near riots and virulent reviews that greeted the work. A central theme in the opera is Schoenberg’s wrestling with his Jewish identity. He had become a Lutheran in 1898, but with the rise of anti-Semitism in the 1920s he began to confront the issue more directly. An important trigger was his experience in 1921 when he and his family were made to break off a summer holiday in the resort town of Mattsee near Salzburg. His darkly sardonic tone in a letter to Berg about the incident—“Toward the end it got very ugly in Mattsee. The people there seemed to despise me as much as if they knew my music.”—sets the stage for a Marx Brothers movie version of the event. As the Nazis gained power in the ’20s and ’30s, he increasingly struggled to reconcile his German and Jewish identities, as he wrote in 1932: “Today I’m proud to call myself a Jew; but I know the difficulties of really being one.” In the spring of 1933 after Hitler was elected as Chancellor and Jews were purged from the Prussian Academy, Schoenberg and his family fled to France in May, where he formally reconverted to Judaism, before boarding a ship to the United States that fall. During this period Schoenberg became involved with efforts to establish a Jewish state. He wrote to the composer Anton Webern in August of his desire to sacrifice his art and “to do nothing in the future but work for the Jewish national cause.” He outlined a plan, referred to in the scene with Thalberg, through which he would travel the world speaking and producing recordings and films to organize assistance for the German Jews. While these ambitions were not realized, he did produce a series of political and religious works in his final years, including A Survivor from Warsaw (1947), which critic Jeremy Eichler has discussed as the first major musical memorial to the Holocaust. Images (top to bottom): Schoenberg in a photograph by Man Ray from 1927; Jesse Darden as Thalberg and Omar Ebrahim as Schoenberg in the World Premiere production (photo by Liza Voll Photography); Tod Machover during a piano workshop of the opera in November of 2017 (photo by Paula Aguilera and Jonathan Williams).